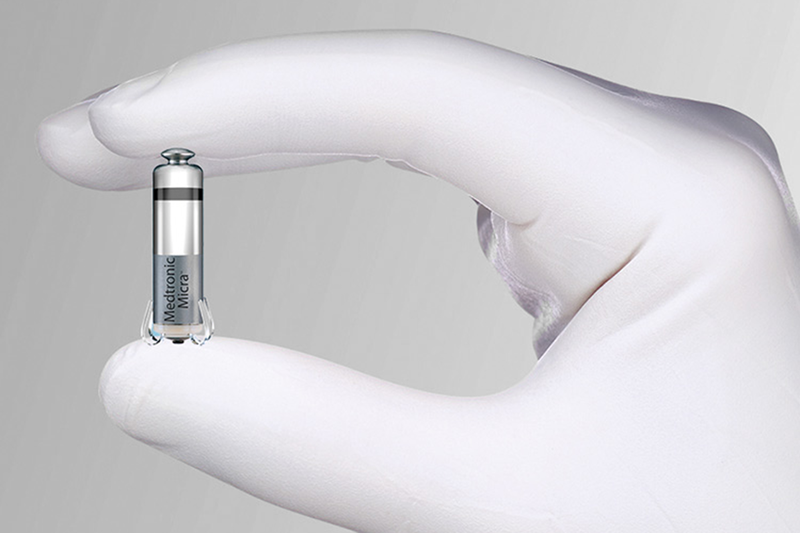 A patient at the University of Michigan Samuel and Jean Frankel Cardiovascular Center has received the world’s smallest pacemaker that works without the use of the connecting leads or wires of a conventional pacemaker. Electrophysiologist Ryan Cunnane, M.D., clinical lecturer of cardiology, recently implanted the new leadless Micra® Transcatheter Pacing System, which stimulates a normal heart rhythm. Micra is revolutionary not only for its size, which is about the same as a large vitamin, but also because it’s placed inside the heart. Micra inserts through a vein in the patient’s groin and is guided to the heart, leaving no chest scar or visible bump as from conventional pacemakers. The leadless device eliminates potential medical complications arising from a chest incision and from wires running from a conventional pacemaker into the heart. Traditional pacemakers sit just under the skin below the collarbone with one or more electrodes running directly into the heart. Though complications of this implantation are uncommon, the electrodes can break, become dislodged or infected, requiring subsequent procedures such as lead extractions. Micra, however, is implanted on the inside heart wall and uses flexible prongs to hold it in place. Electrical impulses are then generated to regulate heart beats in the same fashion as traditional single chamber pacemakers. A clinical trial involving 719 patients implanted with Micra found 98 percent had adequate heart pacing six months after implantation with complications occurring in less than 7 percent of trial participants, according to the Food and Drug Administration, which approved the device in April. Americans are increasingly getting pacemakers to treat bradycardia, a too-slow heart rhythm. If the heart beats too slowly, the brain and body do not get enough blood flow. But by normalizing the heartbeat, pacemakers can ease symptoms like fatigue and fainting and help people be more physically active. Cardiac devices have improved millions of lives since their start as bulky boxes plugged into a wall. The University of Michigan Electrophysiology Program has been on the forefront of the most recent evolution, implanting an MRI-safe implantable cardiovertable defibrillator and today's tiny Micra pacemaker that's free of leads. World's smallest pacemaker is placed directly on the heart to stimulate a normal heart rhythm.